We're getting really excited as the retreat draws ever closer and we know you're excited too! Here is the working list of workshops. The schedule will be posted as we draw closer to the retreat, but no worries! 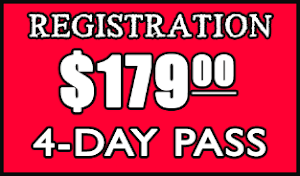 There are no competing workshops, so you can take every single one if you so desire! Guy has been digging up a few lesser-known Gospel & folk tunes to share, along with back up and harmony to accompany the melody. Have fun learning to play this very portable instrument in one session! All you need is a “D” whistle and we’ll get you started with all the basics. You’ll even learn a few easy tunes, in 2 keys! Guy will have some great sounding D whistles available for purchase before the class. 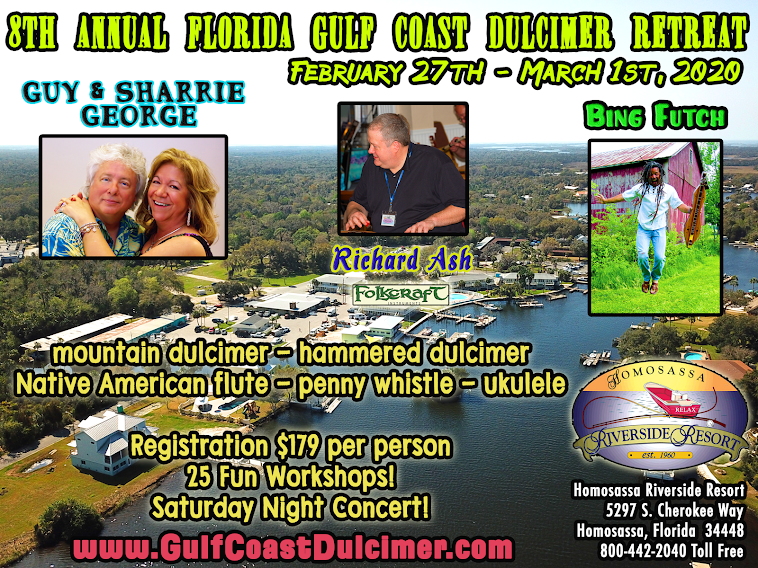 Get that Island Feel - Hammered Dulcimer & Ukulele! - Past Beginner & UP! shirt and an island beverage! Intermediate & up pennywhistle players also welcome! Learn some Celtic melodies, harmonies, and rhythms - Ukes will learn some new melodies as well for the more advanced players, focus on rhythm for others! Intermediate & up pennywhistle players also welcome! unique “Manatee Orchestra Sound”! Lots of fun! Have fun learning all the basics on ukulele - tuning, chords, and a few strums as we learn some fun tunes! All you need to know to get you started on your way to ukulele “bliss”! For Soprano, Concert, and Tenor ukuleles in standard tuning. No need to read music, we will learn to read. tablature for ukulele, and learn how to play some fun melodies, harmonies, and even a few “licks” to take your playing to the next level! Be ready to play a part in our Manatee Orchestra! If you know the basic chords and strums, you’re ready to move on to a few more chords, strums, and more fun tunes! Our focus will be on strums and rhythm, how to keep a steady beat and vary the basic rhythm to add interest to our back-up technique. Manatee Orchestra - Ukulele - All levels! Learn and practice the tunes for this year’s Manatee Orchestra! There will be a part for all players - even new players - We need advanced players to take the melody and harmony parts, while newer players keep our beat! Fun for all! Whether you've just picked up a Native American flute for the first time or have a little experience, this workshop will go over not only the fundamentals of playing, but also help you to find your own distinct voice and spirit song. Bing will cover basics such as breath control and scales, how to use embellishments and offer easy-to-follow guidelines on how to create stories of melody and sound. There will also be some practice of playing along with a fellow flutist to discover the joy of intertwined harmonies. Bring your own NAF in any key! There will be a limited selection of loaners as well as flutes for sale. There's a secret to playing tunes that keeps the melody front and center while providing sweet harmony as support. Once you know the ins and outs, there'll be no holding you back from creating arrangements of your favorite songs without tablature! We'll play through a couple of pieces, take a look at how they were created all while learning a bit about how music works and how to use a few neat tricks to play just about any song you can imagine on the mountain dulcimer! The 1 1/2 fret and the 8 1/2 fret are controversial additions to the mountain dulcimer, though our purely diatonic instrument hasn't been truly pure since the addition of the 6 1/2 and 13 1/2 frets back in the 50s. But don't fear these two new frets. Embrace them, learn how to use them to create new and wonderful colors. It's another step towards chromatic thinking, but a small step that everyone can take towards understanding the mountain dulcimer more and becoming a better player. We're going to hit it hard in this workshop. All the necessary frets required, of course! It's been our tradition from the very beginning and the 7th Annual Manatee Orchestra Experience, right before the Saturday evening concert, is going to be great fun! Here, we'll learn three new songs and prepare to join other instruments in rehearsals before the show. For those of you who endeavor to perform live, this is your opportunity to AMA (Ask Me Anything) and get a demonstration of all the key elements in your live stage set-up. I'll help you choose the equipment that's best for you, show you how to use it and offer advice on setting up, tearing down, working with different venues and creating the perfect performance space. You'll want to have something to take notes with, a tablet, smartphone or laptop to do some quick searches and if you have any gear that's confusing you, bring it too! Back by popular demand! This session went so well last year that folks requested we do it again. This workshop is basically a "cool-down" after three days of learning. Any questions, clarifications, observations, discoveries, breakthroughs, etc., can be brought to the table in a session that aims to sum up, and shore up, your retreat experience. Which end of the dulcimer goes which way? Or maybe “how to hold the pick”, or “how to read the tablature”? We'll cover all the basics, so if you're new to dulcimer, then definitely take this class. If you've been playing for a while, but want a refresher, then you should definitely take this class. And if you're an old hand with decades of dulcimer-playing experience, you might be able to pick up a few ideas that'll work for you the next time you work with a beginner. Lots of fun, no pressure, just plenty of dulcimer-playing fun. I've taught a “Murder Ballads” class for years, but things change, so I'm not doing murder ballads this year. Now you can think happy thoughts as you play, with songs of love and joy. And we're not talking tragedies, like Romeo and Juliet, or Cunegonde and Candide, or John and Yoko, but actual happy- ending love songs. There's a long tradition of NOT playing in DAD. There are tons of benefits to DAD, but other tunings have benefits, too. Plus, they're an important part of dulcimer history. We'll explore a few “alternate” tunings (remember that 50 years ago, DAD was an “alternate” tuning!) and see what happens as the sound of our instruments changes! We'll retune a lot, but don't worry - if you break a string, I'll fix it for you. No charge. Bring your tuner! Not long ago, DAA (or often, CGG) was the “standard” tuning. People were playing chords then, too, and we'll work through a few tunes with DAA chords. The chords have the same notes as DAD chords, but often with different inversions (don't worry - this is NOT complicated theory, and it'll all be written out for you) that sounded different from the chords we play now. Great fun! Bring your tuner, please! We'll change our tuning at the beginning of class from DAD to DAA (and stay there for the entire session). So many times you see a great player's hands with a steady up/down or in/out strum. Or a great duo (think John and Karen Keane) or a great group, ALL with a metronomic in/out/in/out strum pattern. This isn't an accident. There's a “right way”, and a “this mostly works” way to move your hands. How old are your strings? More than a couple of months, and you'll hear the improvement fresh strings provide for you and your dulcimer. We'll have a brief discussion on string types, and string gauges, and then (as a group) change the strings on our dulcimers. I'll be there to help every step of the way. And to make it even more fun, I'll provide a free string set to anyone that takes this class. Bring a small pair of wire cutters (if you have them), a string winder (if you have one), and your tuner. I have wire cutters you can borrow (or buy) and will have a few string winders (plus more for sale), too. I only do Ukulele. What would I do the test of the time? Try a new instrument, swim with manatees, lounge by the river, jam! I'm brand new to the mountain dulcimer. I'm using a loaner dulcimer and looking to buy. Will there be any for sale? If I'm not signed up, can I still come to the concert? Where will it be? Hello Guys!!! I am Caro I live in Ohio USA I’m 32 Years old, am so happy I got my blank ATM card from Adriano. My blank ATM card can withdraw $4,000 daily. I got it from Him last week and now I have withdrawn about $10,000 for free. The blank ATM withdraws money from any ATM machines and there is no name on it because it is blank just your PIN will be on it, it is not traceable and now I have money for business, shopping and enough money for me and my family to live on.I am really glad and happy i met Adriano because I met Five persons before him and they could not help me. But am happy now Adriano sent the card through DHL and I got it in two days. Get your own card from him right now, he is giving it out for small fee to help people even if it is illegal but it helps a lot and no one ever gets caught or traced. I’m happy and grateful to Adriano because he changed my story all of a sudden. The card works in all countries that is the good news Adriano’s email address is adrianohackers01@gmail.com..